#21: Protecting right whales from ship strikes in the U.S. - one step closer? Right whales have been in the news in the past week - The Washington Post, Cape Cod Times, New York Times, National Geographic News to name a few have picked up the story that on Monday, August 25, the National Marine Fisheries Service (NMFS) filed their Final Environmental Impact Statement (FEIS) [PDF] for the Ship Strike Reduction rule. What does this all mean? Well, for many years (nearly a decade), the New England Aquarium, members of the shipping industry, maritime law experts, conservation groups, and the federal government (NMFS) have been working to formulate a strategy to reduce the level of vessel strikes of right whales, the leading known cause of mortality for this small population. In 2001, a suite of recommended measures was submitted to NMFS after years of useful dialog within this group. NMFS conducted further analyses on economic impacts, as well as all other possible options that could be considered, and initiated a rulemaking process to implement several measures including speed restrictions of 10 knots or less along the eastern U.S. seaboard within 30 nautical miles (nm) of port entrances for all vessels over 65 feet in length. This aspect of the federal rulemaking process started in June 2004 with an Advanced Notice of Proposed Rulemaking [PDF]. A Proposed Rule [PDF] was published in June 2006 and a Final Rule [PDF] was submitted to the Office of Management and Budget for their approval in February 2007, a process that typically takes 90 days. It has now been more than 540 days. The longer-than-usual process has not been without hurdles and frustrations along the way, further complicated by political meddling and a twisting of the democratic process. This fact was most recently captured in by articles in the Washington Post and the Cape Cod Times. As a result of this meddling by Vice President Cheney's office and strong opposition from the World Shipping Council, the Office of Management and Budget stalled the rulemaking process for a year and a half. 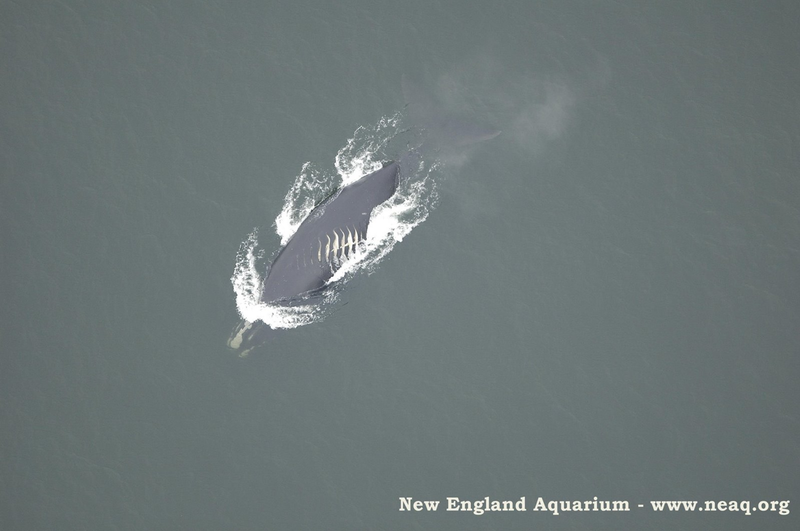 In order for anything to move forward, NMFS had to back off from their initial intent and reduce the 30-mile buffer to 20 miles--a significant reduction in protection for right whales. Yet, this watered down rule will still mean more protection to right whales than no rule at all. So we are cautiously optimistic that the process will continue without additional delays. The FEIS has a 30-day comment period [PDF] after which a Final Rule can be promulgated. Implementation of the Final Rule then occurs 60 days after it is filed however no one knows how long it might take for this last step to happen. Right whales are at a critical junction. The level of reproduction has increased over the last 8 years, so the whales are doing their part. It is essential that the youngsters are given the space the mature and reproduce. Measures to reduce ship strikes have been implemented in the portion of their summer and fall range that includes habitats in eastern Canada. Implementation of the Final Rule in US waters means that right whales will have greater protection from vessel strikes throughout their range along the eastern seaboard of the U.S. and Canada. If the U.S. measure is implemented, right whales may be able to migrate along the urbanized U.S. coastline this winter en route to their calving ground off the southeast U.S. coast in greater safety than they have ever experienced in their lives. That would be a monumental step forward for this struggling species. Stay tuned as this story unfolds over the next several months! Please consider submitting comments on the Final Environmental Impact Statement. You can find the information you need on the NMFS ship strike page. Top Photo: This one year old male, #3522, was struck by an unknown vessel off the southeastern U.S. coast in March 2006. We have not seen this animal since and are not sure it has survived after this severe injury. Bottom Photo: Taken by Jonathan this season in the Bay of Fundy.